Very good morning to you. I am particularly delighted to see the presentation by Scott covering the Greater Bay Area, the Belt and Road. He has almost done all that I have had to cover over here. Let me just give you my take on this 34th AGM of the ISDA. First, I would like to congratulate ISDA on its 34 years of achievements, and commend ISDA for your staunch support and contribution to the development of robust and stable financial markets. Indeed, since its establishment in 1985, the ISDA has been working with global central banks, regulators and the industry to promote the development of safe and efficient derivatives markets. Your very rich agenda today has attracted senior officials, regulators and market practitioners from around the world to converge on Hong Kong. The collage here reminds me that 20 years ago, actually in 1997, there were over 10,000 central bankers, ministry of finance officials and so forth coming to Hong Kong in the new wing (of the Hong Kong Convention and Exhibition Centre), having the annual meeting of the World Bank and IMF (International Monetary Fund). That was when I was with the HKMA (Hong Kong Monetary Authority) when we had this very changeover of Hong Kong from under British sovereignty to China. Today, 22 years on, I can see that Hong Kong has gone from a vibrant market to an even more vibrant market. 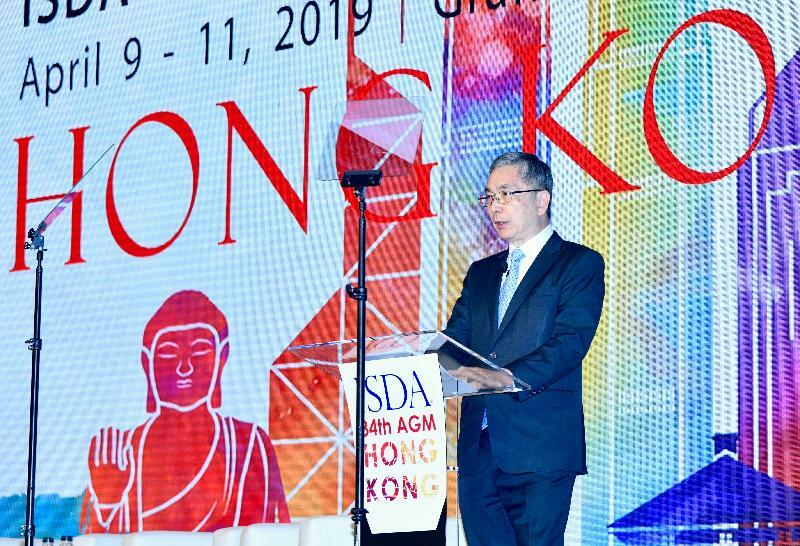 That's why I am very glad I can welcome you here and extend an official welcome to ISDA and all delegates for choosing Hong Kong, our vibrant metropolis as your host city this year. As a leading global financial centre, Hong Kong has much to offer, especially when Hong Kong has become the international financial centre at the doorstep of Mainland China and its huge financial markets. If one looks at the international markets, there are many worrying developments. Some concern geopolitical tension. Some pertain to international trade and the WTO (World Trade Organization) framework. Brexit is on your agenda too. And others are mulling over Brextension, with the word "extension" replacing "exit". Global economic growth has been marked down generally across the board, with a few exceptions. So what are the prospects for Hong Kong? We remain cautiously optimistic and I will speak briefly to address this question. I will then move on to make some observations on certain key developments related to derivatives markets since the global financial crisis in 2008. For years, Hong Kong has been ranking among the top three international financial centres. Hong Kong is home to nearly 80 of the world's top 100 banks, second only to Japan in Asia. Their aggregate balance sheets total around US$3 trillion. Our asset and wealth management sector has a total of about US$3.1 trillion of assets under management, with two-thirds of that coming from non-Hong Kong sources. To further consolidate our status as an asset and wealth management hub, we have put in place a legal regime to diversify and enhance our fund structure. Moreover, open-ended fund companies, along with all onshore and offshore funds, enjoy profits tax exemption. We are also working on a revamp of our regime for limited partnership and that should be introduced into our legislature in this coming year. Our stock market boasts a market capitalisation of US$3.8 trillion, which is about 11 times our GDP. In 2018, we topped the world in initial public offerings (IPOs), taking in some US$37 billion. In fact, during the past 10 years, for six years Hong Kong came first globally for funds raised through IPOs. We have also launched a new listing regime for emerging and innovative enterprises, and they may have weighted voting rights structure, subject to certain governance requirements. The new regime also caters for pre-revenue or pre-profit biotech companies from around the world and we welcome them to list on our stock exchange. Apart from the above bread-and-butter elements of an international financial centre, Hong Kong is unique in our being the leading global hub for offshore Renminbi or Chinese yuan business. Hong Kong currently accounts for over 70 per cent of global RMB payments. On the investment front, a restricted window for capital account transactions was begun in 2014, with the Shanghai-Hong Kong Stock Connect, which was followed by in 2016 the establishment of the Shenzhen-Hong Kong Stock Connect. These two schemes allow eligible Mainland investors to trade in eligible shares listed on the Stock Exchange of Hong Kong. They also allow Hong Kong and overseas investors to trade in eligible shares listed on the Shanghai Stock Exchange and the Shenzhen Stock Exchange. With the convenient access to the Mainland capital markets through these stock connect schemes available on our markets, we have seen more participation by international investors in the Mainland markets. And so much so that we have now seen major international indices such as MSCI and FTSE Russell having included China A-shares in their index portfolios. And the weighting in MSCI is slated to increase to 20 per cent over time too. The inclusion of A-shares in these indices not only demonstrates the success of the internationalisation of the Mainland capital markets, but also signifies the very crucial role that Hong Kong plays in the process. With these international developments, the demand for offshore risk management products and hedging tools has also been on the rise. In light of this, the Hong Kong Exchanges and Clearing Limited, which is our stock exchange, signed a licence agreement with the MSCI last month to introduce futures contracts on the MSCI China A-shares Index. The proposed futures products will cover the large and mid-cap A-shares under the MSCI China A Index, which are accessible via the Stock Connect and represent the A-share portion of the MSCI Emerging Markets Index. This will provide the necessary tool for international investors to track their A-share investments and to manage their risk exposures. Subject to regulatory approval and market conditions, the A-shares Index futures products can be launched as a key tool for risk management and I hope that will happen very soon. This is an important milestone in fostering Hong Kong's important role as the offshore risk management centre for Mainland China. And incidentally I should mention that in the recently announced Greater Bay Area Outline Development Plan, there are four roles which we have identified as the key for Hong Kong. One of them is actually the risk management centre for the financial markets in China in the context of the Greater Bay Area. After talking about A shares, let me turn now to bonds. We launched in Hong Kong in July 2017 a Bond Connect with northbound trading initially. This enables overseas investors to access the onshore bond market through Hong Kong's financial infrastructure, which affords investors greater convenience and flexibility. Such access is crucial because China's bond market, which is worth around US$13 trillion, is the world's third largest, after the United States and Japan, and its importance is continuing to grow. This is especially so when China accounts for about 15 per cent of the global GDP stock but it contributes around 30 per cent of the global GDP growth for the last few years. In fact, Chinese RMB-denominated government bonds and policy bank securities are being added to the Bloomberg Barclays Global Aggregate Index, starting this month on April 1, and phased in over a 20-month period. China's weight in the index is estimated to increase to around 6 per cent and Renminbi will become the world's fourth largest currency component in the index. China's bonds generally have low correlation with developed markets and are regarded as an attractive alternative for investors who wish to diversify their risks. And our stock exchange has plans to develop onshore bond futures products to provide hedging tools for investors who are investing in the Mainland bond market. The increasing openness of the Chinese economy and its financial markets has seen Hong Kong continuing to be a magnet for businesses from the Mainland and around the world. Our latest survey shows a 6.4 per cent increase in 2018 in the number of overseas and Mainland companies setting up in Hong Kong, and the total number now exceeds 8,750. The growth is even more prominent in the number of companies using Hong Kong as their regional headquarters, which now reaches 1,530, up 8.3 per cent from 2017. Our start-up ecosystem has also skyrocketed in the last few years. We now have over 2,600 start-ups in Hong Kong, representing an increase of 18 per cent over 2017. The number of people employed by start-ups also increased by 51 per cent to over 9,500. Ladies and gentlemen, after sharing the opportunities that we have in Hong Kong's financial markets, now I would like to turn to three major developments related to derivative markets since the global financial crisis. First, on the regulatory regime for OTC derivatives. As we all know, a key lesson learnt from the global financial crisis of 2008 is the discovery of structural deficiencies in the OTC derivative markets. There was the proliferation of under-regulated or outright unregulated derivatives. The near absence or the void of regulation and oversight, together with the bilateral nature of OTC derivative transactions, made it extremely difficult for regulators to monitor the build-up of exposures, and to assess OTC derivative positions to gauge the level of threat and impact on the market and the wider economy. Furthermore, the global nature of the derivative transactions and the interconnectivity of market players who are located in different jurisdictions also contributed to the potential for contagion risk. In September 2009, G20 leaders committed to regulatory reforms for OTC derivatives. And in November 2011, G20 leaders further agreed that international standards on margining for non-centrally cleared OTC derivatives should be developed. Hong Kong is committed to implementing these G20 commitments. Our legislation was amended five years ago, with the enactment of the Securities and Futures (Amendment) Ordinance 2014, to provide for a regulatory framework for the introduction of mandatory reporting, clearing and trading obligations. The regime is being implemented in phases and is currently in force for over 90 per cent of OTC derivatives in Hong Kong. This framework helps to reduce counterparty risk and increase market transparency. In the Thirteenth Progress Report on OTC Derivatives Market Reforms, published by the Financial Stability Board in November 2018, Hong Kong was recognised to have achieved satisfactory results and broadly fulfilled all international regulatory requirements. These all underscore the Government's efforts in maintaining an internationally aligned regulatory regime and upholding the quality of our financial markets. We in Hong Kong will continue to contribute in this area to enhance the robustness of the international regulatory regime to increase the resilience of the financial markets while not stifling developments necessary for proper risk management. The second development I would like to address concerns the Interbank offered rates or IBORs. There have been significant developments related to IBORs such as LIBOR for international markets and, for Hong Kong, our HIBOR. IBORs are referenced in a wide array of financial instruments, ranging from residential mortgage loans to interest rate derivatives, affecting large volumes of financial contracts worth trillions of dollars. However, given the decline in unsecured money market transactions since 2008, the credibility of these submission-based benchmarks has come under question, as the longer term IBORs are increasingly based on the expert judgement of contributing banks instead of actual transactions. The risk, as we all know, is that these benchmarks could be subject to manipulation. And this has, indeed, unfortunately happened in a number of jurisdictions with flagrant cases of misconduct. In 2013, the Financial Stability Board established the Official Sector Steering Group. This group of regulators and central banks is tasked to review and reform major IBORs in global financial markets and to encourage the development of transaction-based risk-free rates as alternatives to reference rates. Now, the Financial Conduct Authority in the United Kingdom has already made clear that it will stop compelling banks to contribute to LIBOR after the end of 2021. It is conceivable that LIBOR could possibly become unsustainable or even obsolete if a significant number of LIBOR panel banks should leave the panel after end-2021. And one estimate has it that LIBOR is the benchmark for US$350 trillion in financial contracts worldwide. and I saw in the presentation by Scott that actually for IBORs in general, we are looking at US$370 trillion worldwide. The LIBOR currency areas, that is, the United States, Euro Area, Japan, the UK and Switzerland, have identified near risk-free rates for their currencies as alternatives. Nonetheless, some market participants are still reluctant to make the move because most risk-free rates or near risk-free rates are not forward-looking term rates. Instead, they are overnight interest rates with no term premium and minimal credit spread. In Hong Kong, our central banking institution, the Hong Kong Monetary Authority, issued a circular last month requesting banks to make preparations for the potential transition from HIBOR. The Treasury Markets Association here has also set up a working group to engage stakeholders and enhance their awareness of the critical issues that may arise from the transition. In our case, HIBOR is a benchmark widely recognised as a credible and reliable rate by market participants, and so far we see it desirable and necessary for HIBOR to continue. In fact, some non-LIBOR jurisdictions have indicated that they would adopt a multiple rate approach whereby their interbank offered rates and near risk-free rates will co-exist. At the same time, as Hong Kong is a member of the Financial Stability Board and also of the Official Sector Steering Group, Hong Kong has an obligation to put in place an alternative reference rate as a contingent fallback. The Treasury Markets Association has identified the Hong Kong Dollar Overnight Index Average (HONIA) as the alternative reference rate for HIBOR and will gather market feedback regarding a few technical refinements for this near risk-free rate. So we will need to monitor the financial markets carefully when HIBOR and HONIA operate side by side. It is actually very fortuitous for me to see that ISDA will be co-organising with Bloomberg in Hong Kong a conference on Benchmark Regulation and Migration. On May 30 this year, prominent speakers from the Hong Kong Monetary Authority, Federal Reserve Bank of New York, Reserve Bank of Australia, together with senior business leaders across banks, asset managers and corporations, will come together as an industry, on a neutral platform, to discuss the global changes, assess impact, and explore the way forward that is most applicable and adaptable for the region. I am sure this conference will be instrumental in informing the markets so that the stakeholders can join hands to undergo the transition smoothly and overcome the teething problems. Thirdly, let me say a few words on the increasing importance of corporate treasury centres (CTC). Since the global financial crisis, the centre of gravity of economic growth has continued to shift to Asia. Given the increased importance of the region, multinational companies are setting up corporate treasury centres in Hong Kong to support their treasury activities in the Asia time zone. And very importantly, Mainland enterprises are also utilising the Hong Kong platform to go global in this regard. Centralising treasury management can improve efficiency through economies of scale and standardisation of procedures and processes. Aside from managing cash flows related to operations, investments and financing, corporate treasury centres also manage foreign exchange risk, interest rate risk and commodity risk through OTC derivatives as well as exchange-traded derivatives. Hong Kong offers extensive corporate and investment banking networks, deep capital markets, first-class financial infrastructure, and sophisticated financial and business services. These advantages, together with the low and simple tax rates and the excellent communication and transportation network, continue to attract overseas and Mainland corporations to set up corporate treasury centres in Hong Kong. To provide for a more tax-friendly environment for CTC operations, we have amended our legislation to allow interest deductions under profits tax for corporate treasury centres and to reduce the profits tax for specified treasury activities by 50 per cent. This means a concessionary rate of 8.25 per cent as compared to the full profits tax rate of 16.5 per cent. To address the ring-fencing concern of the OECD, we have also made legislative amendments in July 2018 to extend the half-rate concessions to profits derived from domestic transactions as well as offshore transactions. Ladies and gentlemen, you can see all the efforts we have made in Hong Kong to maintain the competitiveness of our financial markets in order to serve international and also local investors. We will continue to leverage the unique positioning of Hong Kong, seizing every opportunity to give full play to our strengths. Our upcoming policies look to opportunities unleashed by the Greater Bay Area development, the Belt and Road Initiative, and in fact, the whole of Asia and the world. We will enhance the resilience of our financial system, further improve our regulatory regime, and boost investor confidence and protection, all for sustaining Hong Kong's unrivalled status as an international financial centre and risk management centre. I thank every one of you again for coming to Hong Kong, and ISDA especially, for bringing the top professionals of the global derivatives industry to this event. I wish you all a very successful and enjoyable AGM. And do find time to enjoy Hong Kong's friendly city too. Thank you.